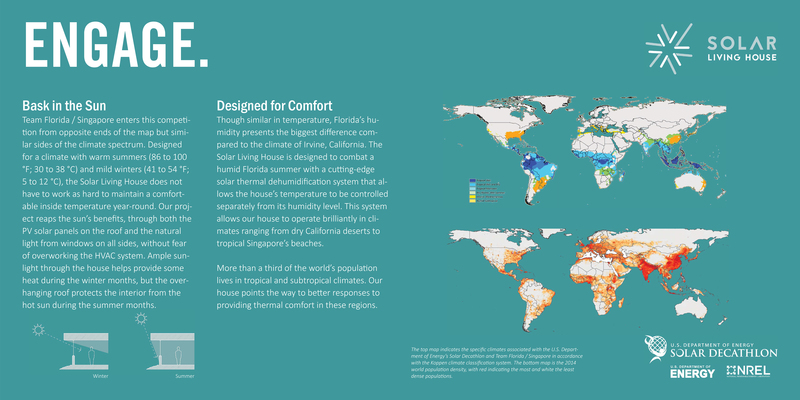 The Solar Living House is a modular single-family home designed by a team of faculty and students from the University of Florida, in collaboration with Santa Fe College, the National University of Singapore, and Alachua Habitat for Humanity. The Solar Living House is a house for living. It centers on people and the activities of daily life while quietly introducing advanced design, construction, and engineering technologies. 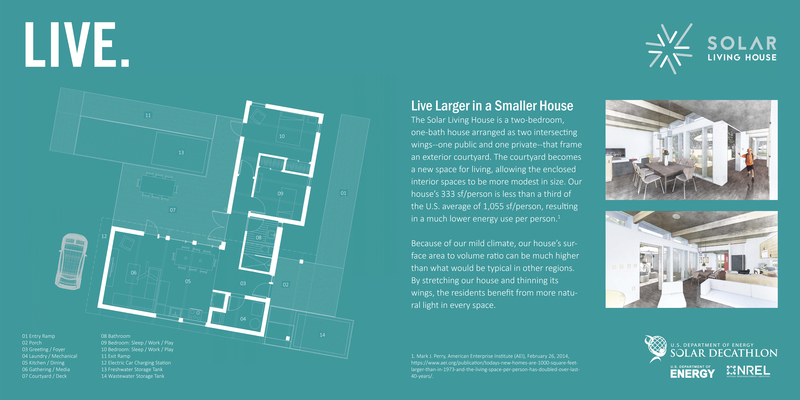 The 993 square-foot two-bedroom one-bath home was designed to embrace and frame an exterior courtyard space. This courtyard acts as an extension of the interior living spaces, maximizing the spatial potentials of a modest building footprint and introducing natural light into the primary living spaces of the house. 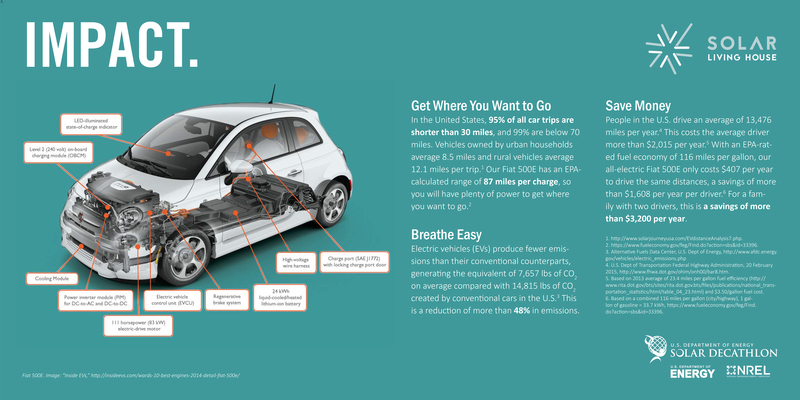 Innovative solar thermal systems control humidity, increase comfort, improve air quality and reduce energy use. The project was designed in accordance with the Solar Decathlon 2015, a research, design, education, and outreach program developed by the U.S. Department of Energy (DOE). Organized and administered by the Office of Energy Efficiency and Renewable Energy (EERE), the program promotes the development and implementation of solar energy systems in residential construction. “Because most opinion, both profound and light-headed, in terms of post war housing is nothing but speculation in the form of talk and reams of paper, it occurs to us that it might be a good idea to get down to cases and at least make a beginning in the gathering of that mass of material that must eventually result in what we know as ‘house – post war.’” Source: Entenza, John. “The Case Study House Program.” Arts & Architecture. 01 1945: 37. Print. John Entenza opened his editorial to the January 1945 issue of Arts and Architecture with the preceding statement, setting in motion one of the most recognized experiments in housing during the modern era, namely the Case Study House program. This experiment resonates for many reasons, but chief among them is how ideas of the house were questioned at a fundamental level, initiating a series of spatial and constructional speculations that aspired to keep pace with an evolving, modern American culture. By embracing the cultural shifts already underway, these houses reframed long-standing attitudes about domestic life, fusing new ways of living with the potentials offered in new materials, innovative construction systems and spatial sensibilities, resulting in visions of “house” far departed from its aging predecessors. Inspired by mid-century modern homes and the Case Study House program, the Solar Living House is a two-bedroom home designed to embrace and frame an exterior courtyard space. Our goal is to create an elegant and disciplined house that expresses its construction in an honest and direct manner; a house that basks in the sun and harnesses the full extent of the energy it affords; a house that reflects the poetic delight of a bygone era, updated and transformed through the technological prowess of our time. We will offer a house that is at once new, yet familiar. We are looking back in order to look forward, synthesizing the clean lines, efficient spaces and material palettes of mid-century modern homes with the efficacy of new envelope strategies, energy-production systems, and novel solar-powered dehumidification systems. Interior view of kitchen and dining areas, with living areas beyond. Interior view of living area, with kitchen, dining, and courtyard beyond. Interior view of dining area and hallway to private wing, with courtyard just outside. Interior view of master bedroom. Exterior View of Front Door. “But this program is not being undertaken in the spirit of the ‘neatest trick of the week.’ We hope it will be understood and accepted as a sincere attempt not merely to preview, but to assist in giving some direction to the creative thinking on housing being done by good architects and good manufacturers whose joint objective is good housing.” Source: Entenza, John. “The Case Study House Program.” Arts & Architecture. 01 1945: 39. Print. 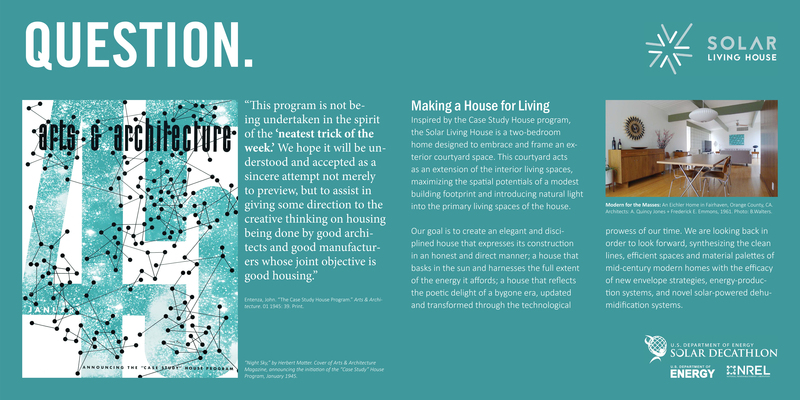 Our proposal for the Solar Living House is born out of the earlier ambitions of the Case Study House program. This program did not merely address the concerns of affordability or utility alone, but rather embraced modernist tenets of spatial thinking and material efficiency. Our interests in the Case Study program, and more so its position as a catalyst to mid-century housing, should be clarified as not fashionably quoting earlier architectural languages, but rather reinvesting in fundamental design principles that informed those languages, and bringing to those languages advanced technological, material, and spatial ideas that can project forward and help define an uncertain architectural future. To accomplish this, we will build from the spatial principles and discipline of our predecessors, preserving the simple elegance of efficient and functional spaces that are beautifully proportioned and informed by the delicate play of light and shadow. We will exercise restraint and honesty in our use of materials, ensuring that the mechanics of construction are thoughtfully expressed under the trying rituals of day-to-day domesticity. We will ensure that our spaces are designed with living in mind, scaled to embrace simple activities by providing an adaptable and accommodating framework to hold the active families of the 21st century. We will make connections between inside and outside, ensuring that the house remains an open vessel for living within a place, and as such, finds a part of its identity through that place. We will address the full comforts of modern living, highlighting those moments where technology can be welcomed as a meaningful part of the larger architectural language while also offering a gentle reminder that the beautiful crafted spaces can do more than hold the material things of modern life. Our house will strive to rekindle personal interaction, to bring people together for a friendly discussion and laughter, and to offer forward the idea that the house remains an integral part of a life well lived. The Solar Living House aims to seamlessly integrate advanced and innovative technologies into its fabric to provide a user-friendly experience for today’s busy families. The house incorporates a number of “tried and true” technologies, including solar photovoltaic panels to generate electricity, solar thermal hot water systems, an electric-powered vehicle, and low-flow plumbing fixtures. In addition, the house incorporates three principal technological innovations: wet/dry modular construction, a building automation system, and solar dehumidification systems. 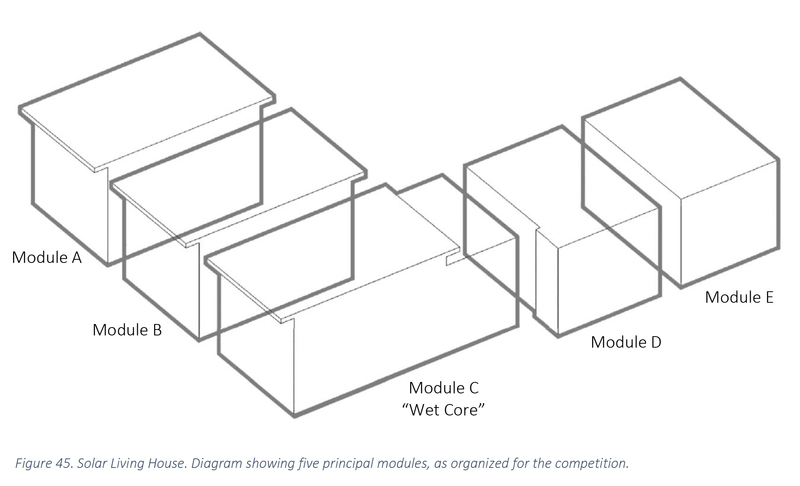 The house is designed as a series of five modules, including one that is designated as the “wet core.” The wet core consolidates the mechanical systems and bathroom into a single module to reduce plumbing runs, efficiency losses, and on-site construction time. The other four modules are designed to eliminate interior load bearing walls to allow for maximum flexibility in the reconfiguring of the space over time. The modules are designed to meet the structural challenges of both Florida’s hurricanes and California’s earthquakes. The house is equipped with an integrated building automation system, allowing the houses environmental systems, lights, security systems, and smoke detectors to be programmed, monitored, and controlled through any mobile or computing device. These systems allow for more precise calibrations of temperature/humidity/lighting to correspond with user needs and preferences, minimizing energy losses with economical night- or day-time setbacks. The most significant technological innovation in the Solar Living House is the solar thermal dehumidification system. 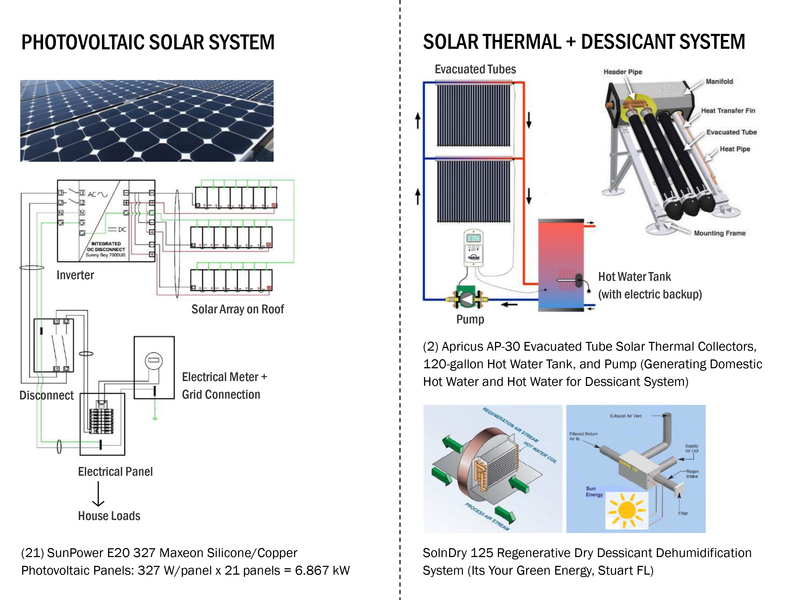 This system generates hot water through two rooftop-mounted evacuated tube solar thermal collectors. The hot water is used to continually dry a regenerative solid desiccant material, typically white silica gel. 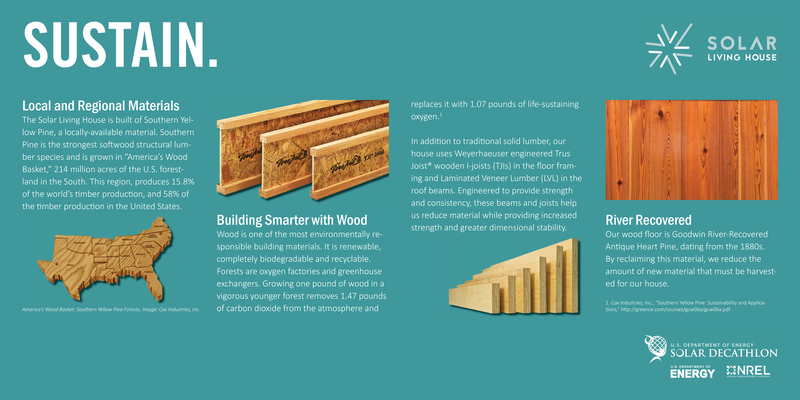 The solid desiccant is used to adsorb moisture and humidity from the air without additional mechanical cooling. 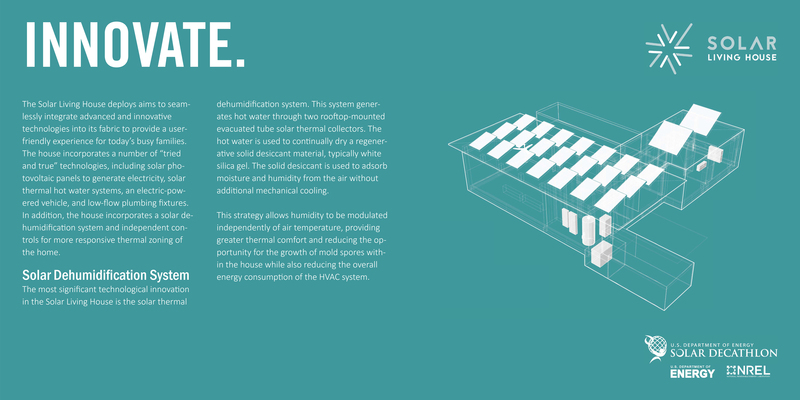 This strategy allows humidity to be modulated independently of air temperature, providing greater thermal comfort and reducing the opportunity for the growth of mold spores within the house while also reducing the overall energy consumption of the HVAC system. “Silica gel is a silicon dioxide (SiO2), an amorphous form of silica which is manufactured from silicate and sulfuric acid. It is a naturally occurring mineral that is purified and processed into beaded or granular form, and is also non-corrosive and chemically inert. Much like a sponge, silica gel’s interconnected pores form a vast surface area that will attract and hold water by adsorption and capillary condensation, enabling silica gel to adsorb about 40% of its weight in water vapor at 100% humidity.” Source: AGM Container Controls, Inc., “About Silica Gel,” http://www.agmcontainer.com/white-silica-gel.html, accessed: 22 April 2015. The team decided to deploy a modular approach for the Solar Living House, where each of the separate modules would be sized to be transported via interstate roadways. In addition to facilitating construction and delivery on-site, the modular approach also allowed the team to address programmatic goals that support adaptability and responsiveness to change over time. 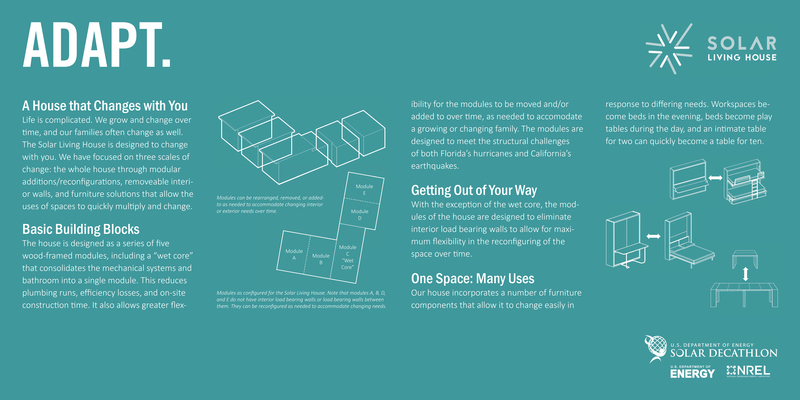 The modules of the house can be rearranged, removed, or added-to as needed to accommodate changing interior or exterior needs over time. Floor Plan and Module Arrangement for Competition. Detailed information about the Solar Living House is available in the Final Technical Report, available online through the U.S. Department of Energy at: https://www.osti.gov/scitech/servlets/purl/1346167 or here: FLOR_FINAL-TECHNICAL-REPORT_2017-03-09. Team Florida / Singapore was organized around a core group of students and faculty at the University of Florida (UF) in Gainesville, Florida, with support from students and faculty at Santa Fe College (Gainesville, Florida) and the National University of Singapore (Singapore). The team leaders were principally graduate and undergraduate students in the UF School of Architecture, working directly with the team’s Faculty Advisor, Bradley Walters AIA, and other faculty. At the conclusion of the project, the team consisted of approximately 74 students and 15 faculty. The student and faculty team was supported by approximately 20 administrative assistants, grant specialists, public relations professionals, development officers, and researchers from the College of Design, Construction and Planning at the University of Florida. In addition, the team included an expansive network of approximately 150 supporters, including direct family members of decathletes, volunteers, and sponsors. H.A. (Skip) Ingley, Ph.D., P.E.